While the international community rightly points at the plight of millions fleeing war and terrorism every day, those people fleeing rapidly escalating climate catastrophes are often forgotten. So who are climate refugees? And why do most institutions talk about climate migrants? Stefanie Mavrakou, a Master of International Affairs candidate at the Hertie School of Governance, analyses the ways in which the limiting terminology surrounding this group of people hems their chances of being recognized in the international refugee regime. In 2015 US Senator Jim Inhofe stood triumphantly in front of Congress with a snowball in his hand. A snowball: the apparently indisputable evidence that global warming is in fact a hoax. Senator Inhofe is a member of the rapidly diminishing group of climate change deniers. Most people now agree that global mean surface temperature is increasing, sea level is rising, and the poles’ ice sheets are steadily retreating. Fuelled by media reports and political discourse, a recurring set of climate change-related images have seared themselves into our conscience – a skinny polar bear clinging onto a tiny piece of ice; forest fires raging across much of the Mediterranean; soil so dry that it is covered in deep cracks. 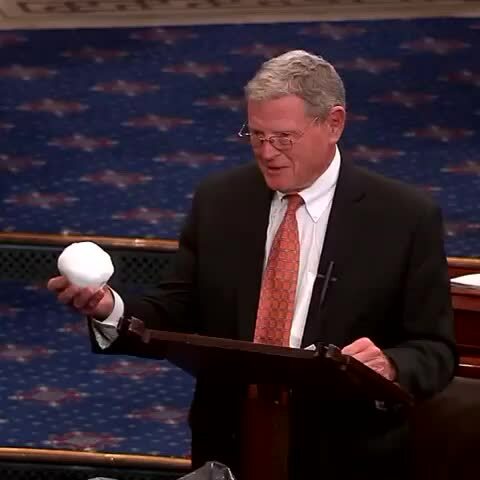 Senator Inhofe showing a snowball in front of the US Congress. Source: Wikimedia Commons. There is another aspect of climate change though, one that is hardly ever talked about: climate refugees. When it comes to these humans, the world seems to prefer to stick its head into the sand and ignore the issue – a phenomenon referred to as an ‘ostrich policy’ in politics. Climate refugees are the people who have to abandon their homes, not due to war or pandemics, but because of increasingly frequent and intense weather events. They are poor rural Indonesians, forced off their farms by the fires and droughts that destroyed their crops and hence livelihoods. They are Edmund Oracion, a Filipino fisherman whose house was ravaged by Typhoon Ineng in 2015 and who is now forced to relocate due to the ever-rising sea level. And while experts and politicians in the high-level political arena are (ever so slightly) starting to touch upon this issue, the notion that recently a new type of refugee has emerged has not trickled into public consciousness yet. As ridiculous as this may sound, part of the issue is terminology. Influential figures aren’t talking about climate refugees. The World Bank, the Guardian, the Institute for Environment and Security all prefer to refer to this group of people as climate migrants. I’m not being pedantic, I promise. Let us take a quick mental journey to geography class in school. A migrant is someone who chooses to resettle elsewhere in search of a better life. A refugee is someone who is forced to flee his or her home and cannot safely return, even if they wanted to. Now, something tells me that Edmund from the Philippines is not willingly leaving behind his ancestral land. He doesn’t want to relocate in search of a brighter future. Faced with incredibly powerful tropical cyclones that endanger our and our family’s lives, would we take a different decision? Edmund, along with all the other people across the globe fleeing climate catastrophes aren’t migrants. They are refugees. 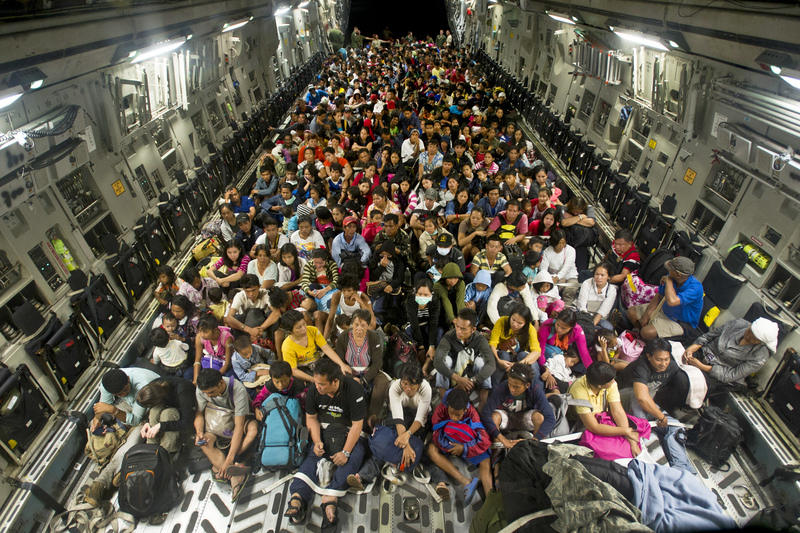 Reisdents of Tacloban (located in the Phillipines) displaced by Typhoon Haiyan. Source: US Department of Defense. The issue of terminology, then, is a crucial one. Words affect how people perceive reality. The word ‘refugee’ conjures powerful images: people squished together on a small dinghy; mothers and their children walking painfully long distances by foot. You get the idea. Unless powerful institutions like the World Bank start acknowledging that the people they are talking about are in fact refugees, the urgency of the situation will continue to be downplayed and the general public will fail to grasp that entire communities of people are being, and will be, displaced by the effects of global warming. More than that however, failing to define these people as refugees has critical legal implications. As the term ‘climate refugee’ is yet to be internationally legally recognised or defined, and as climate refugees are not covered by the 1951 Refugee Convention, they are legally classified as migrants. Hence, just like all other climate refugees, the hundreds of inhabitants of the small pacific nations of Kiribati, Nauru, and Tuvalu who have had to leave their homes due to rising sea-levels cannot apply for asylum in a nearby country. The consequences of this ‘protection gap’ are terrifying. Take the case of sub-Saharan African climate refugees seeking to relocate to Europe. In the face of a non-existent legal framework, they will be herded into overcrowded camps and denied access to schooling and opportunities. I will let the countless reports of inhumane conditions in Libyan refugee camps speak for themselves. In a nutshell, refugees are fleeing rapidly escalating climate catastrophes, only to be faced by an equally terrifying reality in the places supposed to offer them shelter and protection. 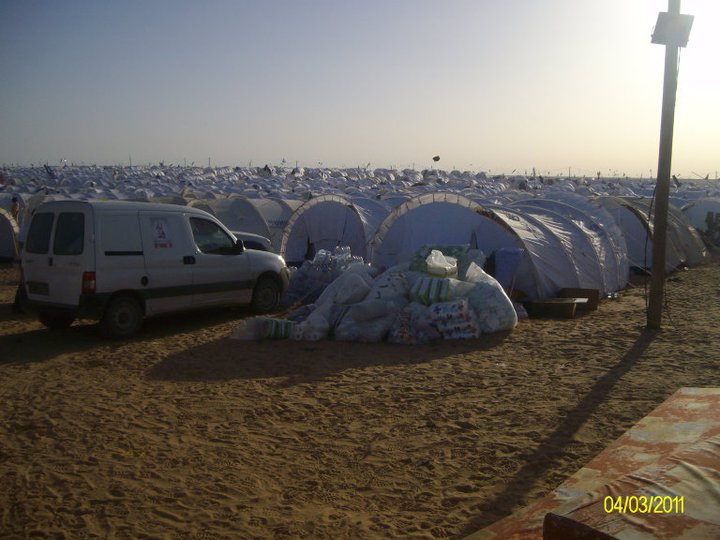 Refugee camp near Libyan border. Source: user Khaled Abdelmoumen on Flickr. Some people might point out that not all people fleeing climate change will want to relocate to another country. Indeed, especially in south-east Asia, many refugees move internally and never cross any international borders. For these people, the need to apply for asylum is not relevant. Nevertheless, their situation will not be any less dire. Many such refugees are expected to move to urban areas, exerting additional pressure on already scarce resources. To make matters worse, there is an ever-growing consensus that such internal relocations could trigger violent inter-ethnic and religious conflicts between refugees and host populations. Whichever way you look at it, the need to acknowledge the reality of climate refugees is no less pressing. Taking a step back, the crux of the issue, of course, is climate change. Thus, the only truly sustainable solutions are those preventing escalating global warming, which will reduce the number of climate refugees. The Great Green Wall, for instance, is an excellent initiative seeking to fight climate change and its effects in the Sahel. The need to tackle climate change is inescapable. But in the meantime, we need to open our eyes to one of the greatest humanitarian crises of our time. Climate change isn’t only starving polar bears. It’s not only unbearably hot summers and rare but abnormally cold winters (yes, I am looking at you, Senator Inhofe). It’s people, people we don’t always see, or people we choose to forget. We rightly point to the plight of millions of people fleeing war and terrorism every day. So why have we ignored a whole other group of people fleeing climate change? Let’s pull our head out of the sand, and let’s do it now. The typhoons aren’t waiting. Stefanie Mavrakou is a class of 2020 Masters of International Affairs candidate at the Hertie School of Governance. She holds a bachelor’s degree in Geography from the University of Cambridge, where she specialized in geopolitics, economic- and historical geography. She just completed an internship at the UN Office for Drugs and Crime and is currently working at the NATO Operational Headquarter in the Netherlands. Besides her interest in diplomacy as well as foreign and security policy, Stefanie loves dancing, reading books, and travelling the world. This article was originally published on the Hertie School of Governance’s student-run blog, The Governance Post.